During a wildfire, thousands of embers can rain down on your roof and pelt the side of your home like hail during a storm. If these embers become lodged in something easily ignited that is on or near your house, it could burn. Common materials that become embers during a wildfire include pine cones, branches, tree bark, and wooden shingles. Embers coming in contact with flammable material is the major reason homes are destroyed during a wildfire. Depending on fire intensity, wind speed, and the size of materials that are burning, embers can be carried more than a mile ahead of the fire. 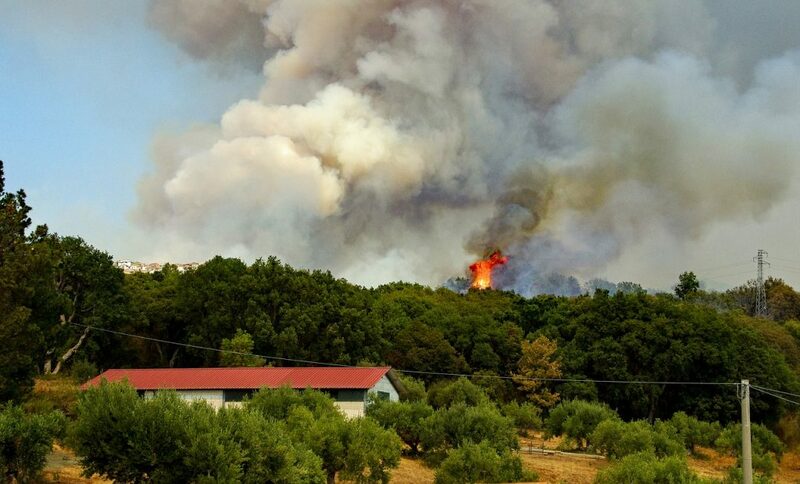 Consequently, even homes or neighborhoods located blocks or miles away from the actual flame front are vulnerable to ignition and complete destruction. 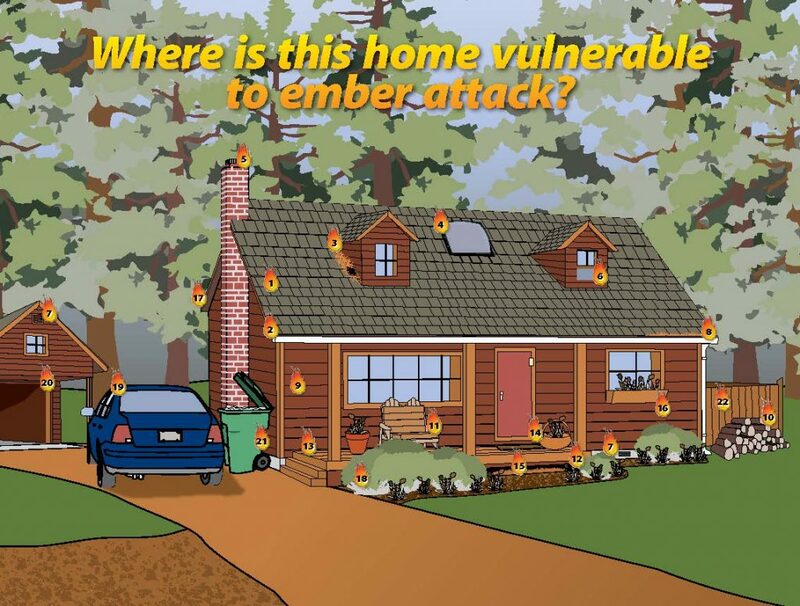 By being aware and taking action ahead of time, a homeowner can substantially reduce the ember threat by addressing the 22 items on the list and graphic below. 3. Roof debris – leaves and branches? 5. Spark arrestor screen in place? 6. Windows broken or open? 10. Woodpiles 30’ from building? 12. Deck boards sound and intact? 13. Deck debris — ignitables on deck? 14. Porch and accessories — combustibles? 15. Under deck enclosed? Woody debris? 16. Flower boxes — dried plant material? 17. Eaves — accumulated leaves, needles? 18. Flowerbeds — combustible mulch? 19. Vehicles — windows closed? 20. Garage door — closed? 21. Garbage cans — covered? 22. Wooden Fences — sound, detached?